Carla R. Herrera, Blue Tent. Smashwords, 2012. Pp. 21. ISBN 9781476127002. Free. 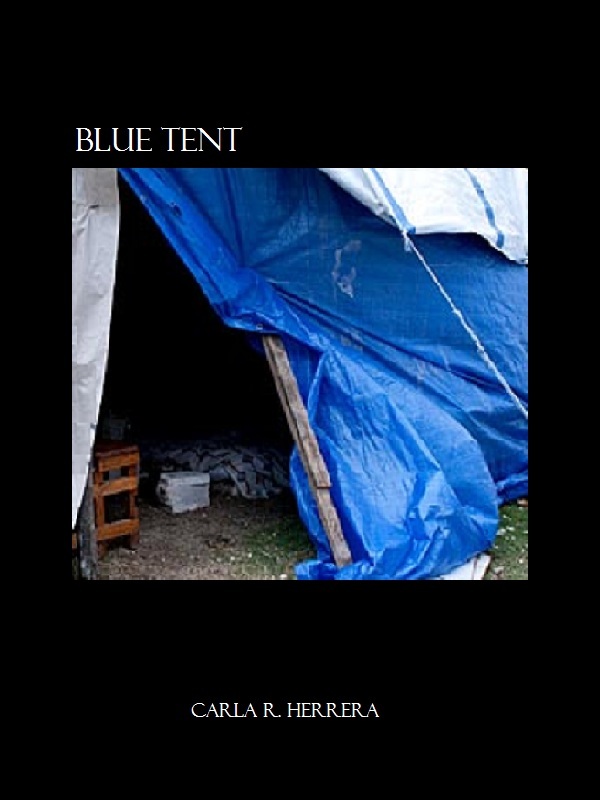 Blue Tent is a short story by Carla R. Herrera and available via Smashwords. Set in a futuristic dystopian USA where the veneer of democracy has fallen to the point the country is now known as The Corporate States, protagonist Tele is in hiding from the authorities after taking part in a protest. She had no choice but to leave behind her family and live out a low-profile existence in a poverty-ridden camp. Such places are rife with danger but she manages to get by with the protection of an Inprod, a form of customised taser. She lives with hope of one day returning to her family. The story tells of the society in which Tele now lives, both from a broader description of The Corporate States and the slum she now lives in. Through eight short chapters a variety of contemporary socio-political topics are highlighted. It describes various events in which the starkness of Tele’s existence, and the existence of those around her, is so desperate. These include the need to fight off thugs and neighbours dying due to lack of basic healthcare. It entertains broader contemporary notions too such as protest and discontent, even memetic philosophy and it’s place in society. For me anyway, this was where the narrative really shined and I was left wishing there was more. Character-wise, the story teems with potential. Protagonist Tele battles regularly with doubt and worry, yet holds a powerful idea of hope that she might return to her family one day. She speaks her mind but this often is belied with caution that such dissenting topics might lead her away from a reunion. Readers are introduced to cheery Bufo in chapter three, a chummy, lower-class fellow who becomes Tele’s friend. June Davis, a retired teacher whose disabilities have caused her to be a societal outcast appears in the following chapter. These represent Tele’s associates in the narrative and become collaborators in their mutual feelings of discontent. There’s an interesting few moments in the story where these and other peripheral characters discuss societal problems from very different perspectives of class, gender and ability. There is focus on the role of memes in society and the spreading of ideas by graffiti and slogans. One might only be reminded of the popularity of memes on the internet and their subsequent academic exploration as vehicles for powerful ideas. Also the notoriety of contemporary artists such as Banksy as a proponent and creator of subtle yet powerful ideas. While these, sadly, are discussed in no great depth, it becomes clear the group begin to feel empowered to do something themselves as a means of protest. Dystopian texts are mostly critical satires of our own society and the links between The Corporate States and contemporary western society are very strong. There is plenty of familiarity to really immerse the reader in a world not too many steps away from our own. With any short story I would guess, every exciting narrative point, regardless of potential, has to be clipped down in order to progress and this often felt like a genuine shame, even a missed opportunity. Each diamond of thought has to be brushed over with little discussion, but this is perhaps too evidence of how powerful just a small idea can be, whether that be in the mind of a dissident or in that of a short-story reader. The overriding theme for me was the power of ideas and how they can galvanise a community, or even destroy it. Wispy notions of discontent in the narrative become life-threateningly serious, despite their complete ambiguity. The society described in Blue Tent might be fragmented, messy and unfair one, but the Thought Police would seem to be as powerful as in Orwell’s more regulated and controlled Airstrip One. As soon as a powerful idea can be born, so too can it be crushed. Lastly and, for someone who love dystopian texts, altogether indulgently for me personally, the story ends on somewhat of a downer. Whereas most dystopian texts finish with the brave protagonist escaping oppression, or at least with a comforting hint towards a happier ending—even such as one which defers beyond the end of the story such as Winston Smith’s assertion that hope “must lie in the proles”—Blue Tent ends on a particularly brutal knife twist. It’s certainly brave, and maybe much too negative for readers who like to be coddled, comforted and reassured at the end of a story, but it leaves a far bigger impression. Therefore, if you like your speculative fiction well-described and yet remarkably bleak, Blue Tent is a real, and altogether rare, gem. I also found this to be an extremely powerful and moving story, and I felt the ending added dramatically to its force. It strikes me that so many people prefer their dystopias to have happy endings. It may parallel the quaint 'occupy' notion that camping out for a while might suffice to change the world. After all, it seems so easy in fiction.